Cathedral 51% Beeswax Altar Candles - 7/8" x 8"
Cathedral's 51% Beeswax candles feature a dimensional design and are expertly crafted for table altars. Insistence on the finest beeswax is long standing because the wax is symbolic of the purity of Christ Himself. 7/8" x 8", plain end, sold in boxes of 36. Made in the USA. 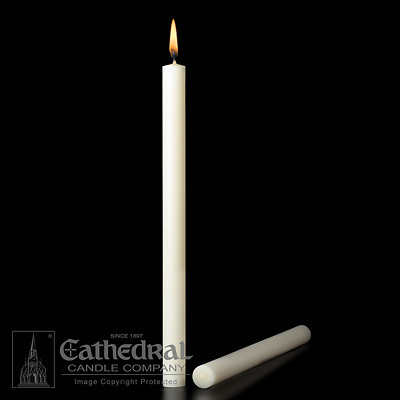 ***IMPORTANT: Candle followers should be used for the satisfactory and economical performance of your church candles. Usually ships in 7-10 business days. Ships from a Cokesbury Connect Partner.